This article describes specifics for the SiFive Arty FPGA Dev Kit. 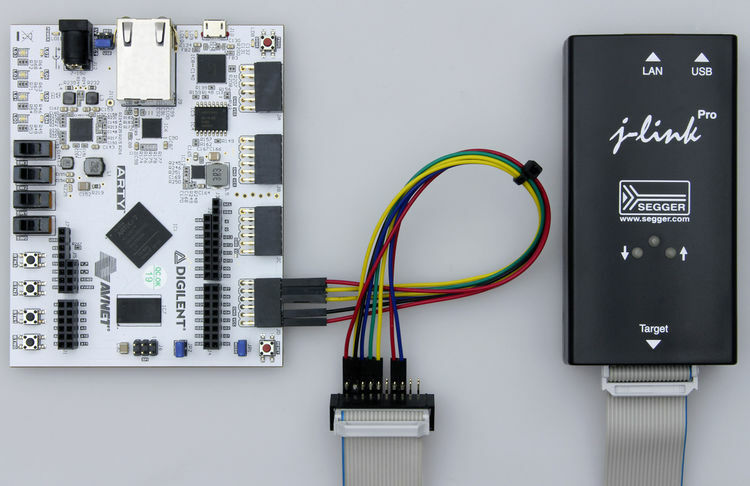 The SiFive Arty FPGA Dev Kit does not come with a standard debug connector but populates the debug JTAG signals on a custom connector. Therefore, it needs to be manually wired in case J-Link shall be connected to it. In the following, it is described how the pins of connector JD on the ARTY board needs to be wired to J-Link. All pins of the J-Link side refer to the standard 0.1" 20-pin connector of J-Link. 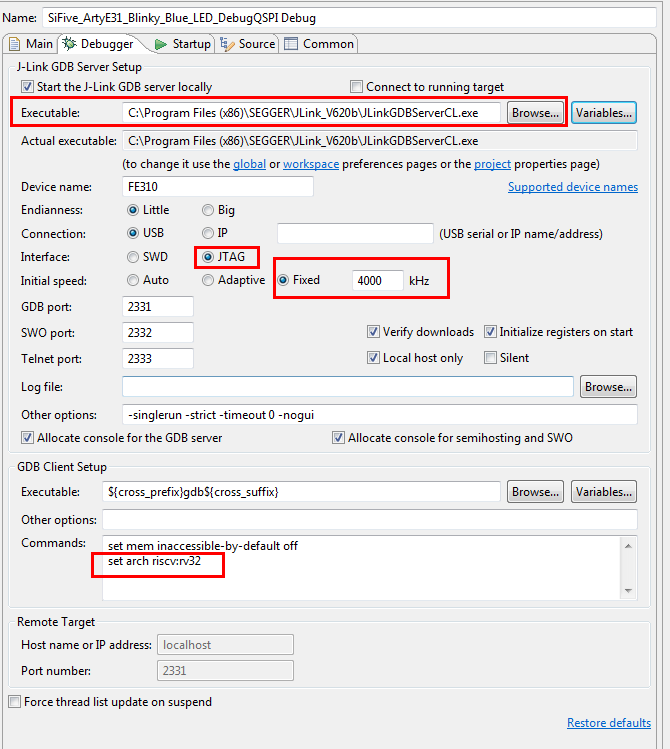 In the following, the procedure how to setup a J-Link debug session in SiFive FreedomStudio is described. This tutorial assumes that there is already a compiling project present in FreedomStudio. If not, please find a selection of example projects here. 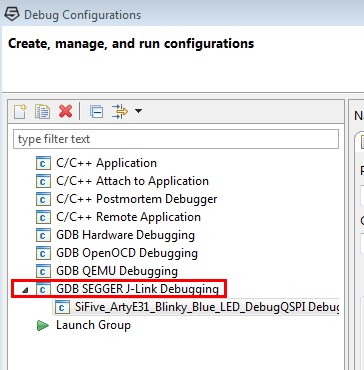 Double click on "GDB SEGGER J-Link Debugging"
In the following, sample projects for the ARTY board running the SiFive FE310 MCU FPGA stream, can be downloaded. The following projects are configured to demonstrate debugging of an application in the internal RAM of the SiFive FE310 MCU. 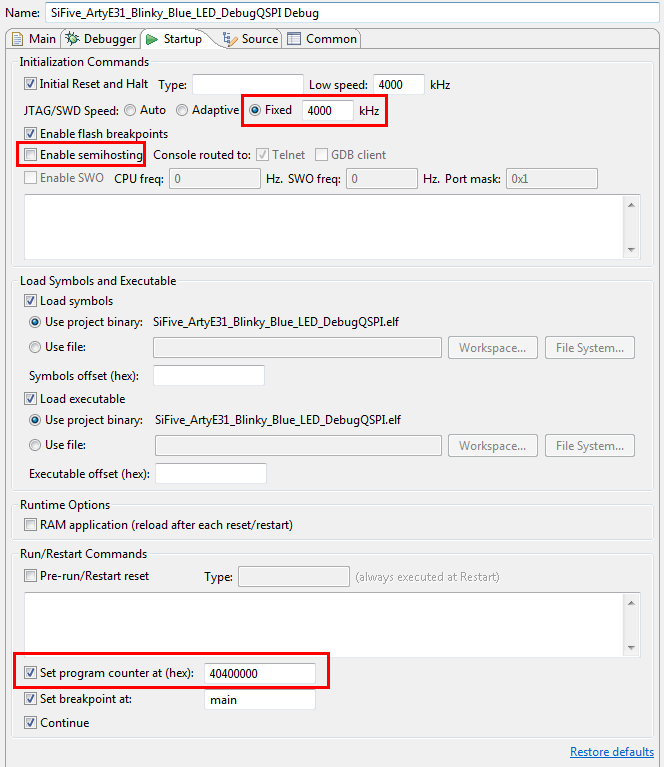 The following projects are configured to demonstrate debugging of an application in the external QSPI flash connected to the SiFive FE310 MCU. The J-Link software comes with a flashloader that supports programming of the external Micron 25Q128A QSPI NOR flash populated on the ARTY board. In case a different flash is used on the hardware, the flashloader needs to be modified. Please get in touch with SEGGER to obtain the source code of the flashloader to perform the necessary adaptions. FPGA bitstreams with debug specification v0p13 are currently supported e.g. release version v1p0. This page was last modified on 12 October 2018, at 10:43.